Jade Seed Wellness Clinic was welcomed to the La Mesa Chamber of Commerce at the clinic’s ribbon-cutting ceremony on Thursday, Oct. 18. Owner and founder Lacey Dupré and her team opened the business doors for the event at the new clinic’s Fletcher Parkway location. The La Mesa Chamber celebrated the entrance of a new member to their business community and the business received a Senate certificate of recognition provided by state Senator Joel Anderson, who represents La Mesa in the 38th District. 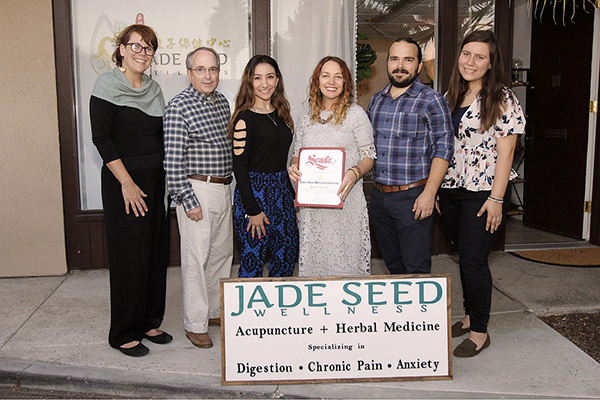 “It’s my pleasure to welcome Jade Seed Wellness Clinic to the La Mesa community and recognize their commitment to the health of our community and contributions to our local economy,” Anderson said. President and CEO of the La Mesa Chamber of Commerce, Mary England, and La Mesa Mayor Mark Arapostathis also attended the opening of the Jade Seed Wellness Clinic. The La Mesa Chamber of Commerce works together with businesses in La Mesa to help grow the local economy and advocate for public policy that supports economic development. By focusing on building relationships between small businesses and their elected representatives, the chamber hopes to create better awareness regarding the issues facing the small businesses in La Mesa. “We are happy to be part of the community and we really want people to feel welcome just coming in and seeing what it is that we do towards their goals of being happy,” said Kelly Samuel, reflexologist for the Jade Seed Wellness team, who was excited about their opening in La Mesa. —Andrea Capella is a legislative intern for Sen. Joel Anderson’s office.